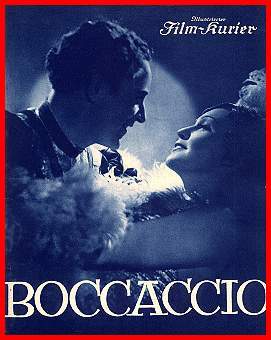 Scheda: Nazione: Germania - Produzione: Universum Film A.G. (UFA) - Distribuzione: Universum Film A.G. (UFA) - Sceneggiatura: Emil Burri - Fotografia: Konstantin Irmen-Tschet - Musiche: Franz Doelle - Formato: B.N. Cast: Albrecht Schoenhals, Gina Falckenberg, Willy Fritsch, Heli Finkenzeller, Paul Kemp, Fita Benkhoff, Albert Florath, Tina Eilers, Ernst Waldow, Hans Hermann Schaufuss, Helmut Weiss. Plot Summary, Synopsis, Review: entertainment.msn.com - deutscher-tonfilm.de - tvguide.com: «Renaissance Italy as seen (inaccurately) through the eyes of the officially sanctioned Nazi film industry, all in operetta form. When The Decameron's lusty stories mysteriously appear in Ferrara, they inspire...». Conosciuto anche con il titolo: Liebesgeschichten von Boccaccio.